Dr. Arekapudi earned her medical degree from Gandhi Medical College in Hyderabad, A.P., India. She then moved to the United States to complete an internal medicine internship at Rush Presbyterian Hospital in Chicago and three-year hematology and oncology fellowship at Northwestern University. Over the course of her career, she has played an active role in clinical trials and protocols on the subject of cancer, and continually strives to stay abreast of the latest research and therapies available for cancer and hematology patients. 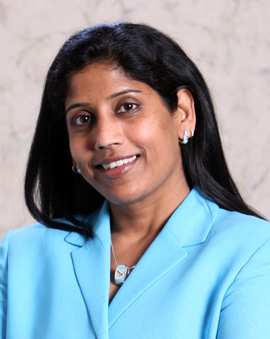 Dr. Arekapudi is dedicated to the optimal care of her patients. She enjoys music, classical dancing and spending time with her son who completely supports her career and endeavors.